At the dawn of the eighteenth century Tsar Peter the Great turned away from the old church-dominated, wooden world of Muscovy and cut a window to the West, creating a new capital on the coast of the Baltic. 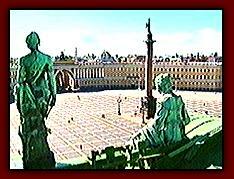 St. Petersburg, Peter the Greats grand legacy, was begun in 1703 on marshy territory won from Sweden. Foreign architects directed all construction, and untold thousands died in the process. Within a decade, St. Petersburg was a city of nearly 35,000 buildings and the capital of all of Russia. It was a city of endless colonnades, heroic statuary and great architectural ensembles, a city designed not so much for people, as for parades. Under the Angel of Victory, the largest monolithic granite column in the world, mass parades filled the broad streets of Petersburg. They stretched out through the city and continued into the Soviet period when the city was renamed Leningrad.